So, on Friday, we finally held a wake for Nottingham’s former Lib Dem councillors and a few extra people who had worked for us at the council. We struggled to find a date we could all do, as well as an activity that suited everyone – eg pub would be no good for our various teetotal, recovering alcholic or Muslim colleagues. 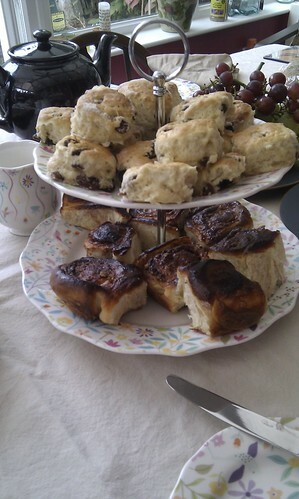 Eventually I offered to cook afternoon tea for everyone. A Muffaletta sandwich is a huge American thing based on muffaletta bread, which is round and seeded, stacked high with ham and provolone cheese and also includes a sort of pickled olive salad, apparently. I first encountered this from Olive magazine, and their version appears nothing like the American version. And then my version is different again because the only bread that seemed vaguely available in the supermarket was tiger bread, the whole white loafs with crunch toppings. You blend a jar of artichoke hearts (Sainsbugs has them in tins) into some mayonnaise, slice the loaf horizontally and spread the artichoke/mayo mix on the top and bottom. 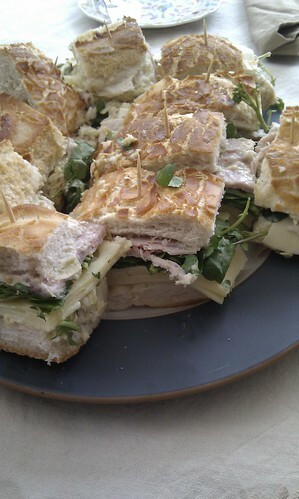 Layer the loaf with lots of ham, a bag of mixed leaf salad and lots of sliced Emmental cheese and put the loaf back together. Press firmly – indeed leave it under a weight if you can, although I couldn’t quite figure out how to do this without the weight sliding off. Slice into individual sandwiches. Secure sandwiches with a toothpick with an optional green olive in the top. Verdict: this was delicious, and all of it got eaten. But it was a slimy, horribly mess to make, and the top and bottom of the load, despite being secured with toothpicks, got sheared away from each other when sliced. Have to work on the methodology, but will deffo do again. One tin of artichoke hearts and two huge spoons of mayo was far too much for one small tiger loaf. No real mystery here: two tins of tuna, big dollop of mayo, half a red pepper deseeded and chopped very finely spooned into wholemeal rolls and served with thinly sliced cucumbers. 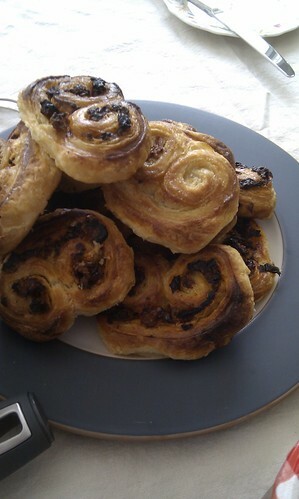 I have made these once before (recipe here) – and once again they were gorgeous: soft, spicy dough, sweet cinnamon filling. Highly recommended! This time I used the same amount of dough in a much bigger tin and got a much higher yield. I had leftover buttermilk, so substituted some of the milk for that. I must have misidentified the size of my cutter, using my smallest, because I got 16 tiny scones out of half of the dough before giving up and freezing the other half. I didn’t use cherries, just sultanas. (Cherries are for cherry scones! Fruit scones are sultanas only!) Served with clotted cream and strawberry jam. I had been hemming and hawing about which cake to make and finally settled on this one. It got rave reviews, but I found it ever so slightly meh. More a gateau than a cake. I tried to ice it but the ganache topping wasn’t sturdy enough to ice letters onto. Tea and coffee. Of course. I quite enjoyed the cooking and people seemed to enjoy eating it, but the cleaning was knackering and it’s hard to divorce the effort of the two in my mind. Perhaps if the house were routinely more clean, this sort of thing would be less of a trial? I thought a few weeks ago that I would try afternoon tea as a way of easing into supperclubs but as I was hoovering and plating and laying the table, I found myself thinking that it was ridiculous that people would pay money to come and eat brown food in a filthy house. I lack the perspective to think whether I am doing myself down or being sensibly realistic.